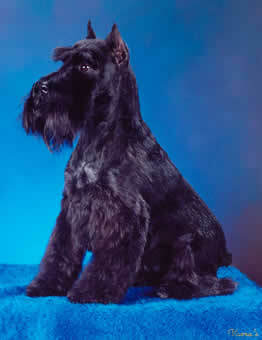 Miniature Schnauzers, reportedly a cross between the Standard Schnauzer and the Affenpinscher, were originally bred to catch vermin. They are robust, alert, happy dogs. They make excellent companions because they are playful, affectionate, and intelligent. They do not shed and generally cause fewer symptoms in people allergic to dogs than do most other breeds. 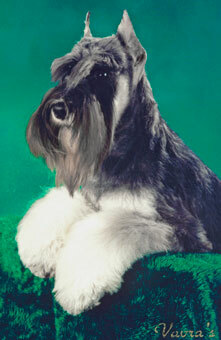 Miniature Schnauzers are double-coated. They have a wiry outer coat and a fine undercoat, but the two coats tend to blend when the animals are clippered. Salt and Pepper—The typical salt and pepper color of the topcoat results from the combination of black and white banded hairs and solid black and white unbanded hairs, with the banded hairs predominating. Acceptable are all shades of salt and pepper, from the light to dark mixtures with tan shadings permissible in the banded or unbanded hair of the topcoat. In salt and pepper dogs, the salt and pepper mixture fades out to light gray or silver white in the eyebrows, whiskers, cheeks, under throat, inside ears, across chest, under tail, leg furnishings, and inside hind legs. It may or may not also fade out on the underbody. However, if so, the lighter underbody hair is not to rise higher on the sides of the body than the front elbows. Black and Silver—The black and silver generally follows the same pattern as the salt and pepper. The entire salt and pepper section must be black. The black color in the topcoat of the black and silver is a true rich color with black undercoat. The stripped portion is free from any fading or brown tinge and the underbody should be dark. Black—Black is the only solid color allowed. Ideally, the black color in the topcoat is a true rich glossy color with the undercoat being less intense, a soft matting shade of black. This is natural and should not be penalized in any way. The stripped portion is free from any fading or brown tinge. The scissored and clippered areas have lighter shades of black. A small white spot on the chest is permitted, as is an occasional single white hair elsewhere on the body. Disqualifications: Color solid white or white striping, patching, or spotting on the colored areas of the dog, except for the small white spot permitted on the chest of the black. The body coat color in salt and pepper and black and silver dogs fades out to light gray or silver white under the throat and across the chest. Between them there exists a natural body coat color. Any irregular or connecting blaze or white mark in this section is considered a white patch on the body, which is also a disqualification. 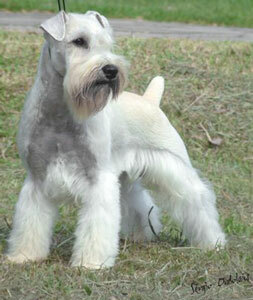 White Miniature Schnauzers are disqualified under the U.S. and Canadian Miniature Schnauzer breed standards. They are not eligible to compete in AKC or Canadian Kennel Club (CKC) conformation shows. White, however, is recognized in countries which are members of the Federation Cynologique Internationale and white Schnauzers are eligible to compete in those countries. 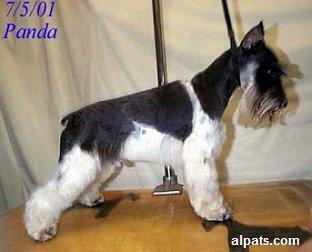 Below is a Brazilian Champion white Miniature Schnauzer. Parti-colored Miniature Schnauzers, liver-colored Miniature Schnauzers, and those of any colors other than those discussed above, are disqualified under the U.S. and Canadian Miniature Schnauzer breed standards, AND under the breed standard of the FCI as well. 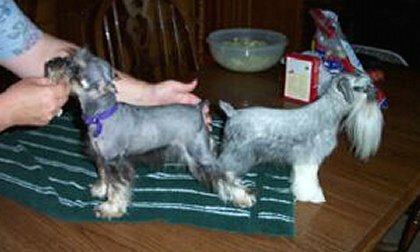 Shown below are a parti-colored undersized Miniature Schnauzer, and a liver-colored Miniature Schnauzer, both from a kennel that apparently specializes in breeding Miniature Schnauzers that do NOT comply with the breed standard. Miniature Schnauzers must be between 12" and 14" tall, measured at the highest point of the shoulder blades, to be shown in the U.S. and Canada. 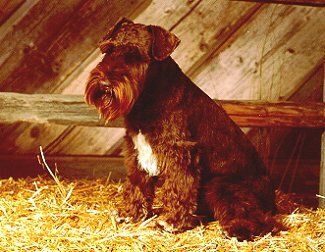 Miniature Schnauzers should be sturdily built, nearly square in proportion of body length to height, with plenty of bone and without any suggestion of toyishness. Standard Schnauzer males must be between 18 1/2" and 19 1/2", and females must be between 17 1/2" and 18 1/2", both measured at the highest point of the shoulder blades. 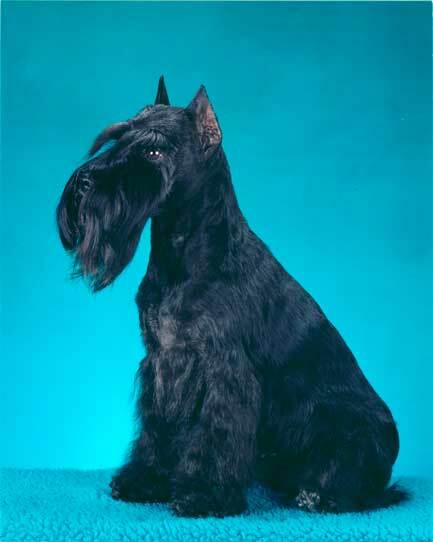 Giant Schnauzer males must be between 25 1/2" and 27 1/2", and females must be between 23 1/2" and 25 1/2", both measured at the highest point of the shoulder blades. 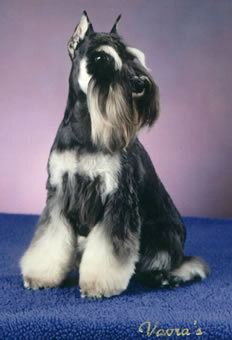 There is no such thing as a "Toy Schnauzer" or a "Teacup Schnauzer." Animals advertised as such are merely undersized Miniature Schnauzers, being marketed with a "cutesy" name by puppy mills. Pictured below is a woefully undersized puppy being advertised on the website of a breeder who breeds "toy" Miniature Schnauzers and mismarked Miniature Schnauzers that do NOT comply with the breed standard. "The standard for a regular size mini is from 12" to 14" tall at the top of the shoulder blade, which are called withers. On a toy that would be up to 11" at the top of the withers. There is no room for micro, pocket, tiny toy or anything else some breeders have come up with to extract more money from the buyer." The truth is that "toy schnauzers" are exactly the same as "micro," "pocket," and "tiny toy." ALL OF THEM are undersized Miniature Schnauzers, which unscrupulous sellers are trying to market to buyers who are foolish enough to believe the lies.